Uniblue Systems' SpeedUpMyPC 2013 describes its mission in its name. It combines several tools in one interface, including a system scanner, RAM optimizer, memory cleaner, start-up manager, and CPU booster, all optimized for the latest versions of Window. SpeedUpMyPC's interface is typical of system-boosting utilities, simple and colorful with large, clearly labeled controls and prominent visual and text warnings of your unoptimized system's shortcomings. Scanning our system identified numerous "issues" slowing it down or compromising its security, everything from unnecessary services running to out-of-date drivers and full browser caches. You can also have it scan and clean your Registry, but, with all such utilities, we recommend caution in the Registry because of the potential for damage. 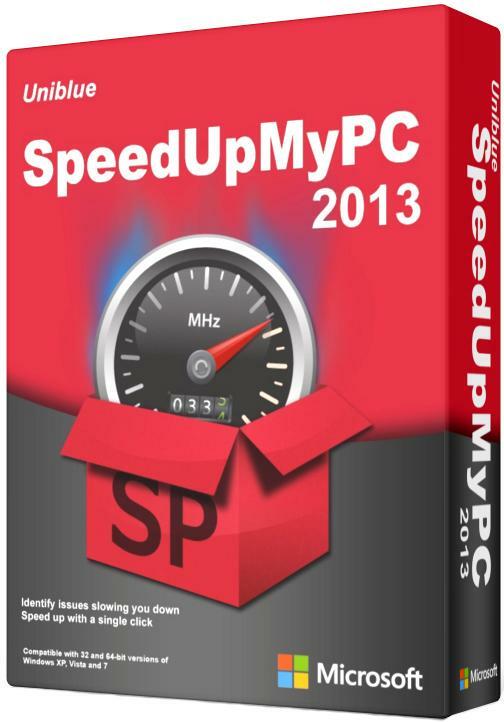 Tools like SpeedUpMyPC can clear out the deadwood and speed up your system, as advertised, but they can be too easy to use, leading to problems if critical items get deleted unintentionally. Just be sure to be careful and follow instructions: there's a PDF-based Help manual to keep you on the straight and narrow and keep your PC humming. For queries feel free to contact.